There are several artists/group who share the name Hooligan. One of them is a Korean rock band. Here is what Hooligan (???) have to say about themselves on their official site: These aren't the hooligans that go crazy over football. No, these five guys simply share a common passion for music and their music is listed #1 on their crucial list. They don't care what the world thinks of them nor do they give any concerns to how others might see them. These people, they're just a group of perhaps simple-minded and perhaps somewhat odd men who go crazy for music. These aren't the hooligans that go crazy over football. No, these five guys simply share a common passion for music and their music is listed #1 on their crucial list. They don't care what the world thinks of them nor do they give any concerns to how others might see them. These people, they're just a group of perhaps simple-minded and perhaps somewhat odd men who go crazy for music. As long as they're making and playing their music, they've got nothing in the world to fear. What's more, the second you really listen to their music, you'll be no different from them. They may be rough sometimes but then again, there's no one who can be softer. They may sometimes appear to be a monster, but there's no doubt that there are none who's more kind-hearted then these people. These five guys who react so passionately under the name of music, no questions asked, they are THE Hooligans. 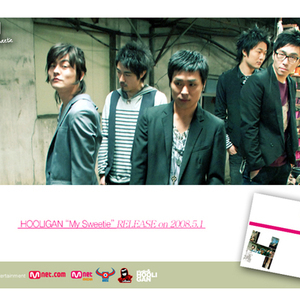 In May 2008 they released their 4th album: "My Sweety". Creation of the group ?Hooligan? Began career starting with the ?National Live Club? Invited as guest to the ?518 Rock Festival? Released 1st E.P. ?ARE U TIRED? Participated in the creation of the ?Hip Hop Train? Participated in the creation of the album ?Underground? Participated in the Music Festival ?Gate in SEOUL? Participated in the ?5th Ssamzie Sound Festival? Invited to the ?Junju International Film Festival,? ?Buchun International Film Festival? Released first official album ?Hooligan Party? Participated in the ?June Nanjang Festival? Released second official album, ?Overlap? Worked on main O.S.T. for online game ?Red Card? Worked on main O.S.T. for the televised drama ?Dasepo Naughty Girl? Released third official album ?Hello, Monday? Released fourth official album ?My Sweetie?